A healthy, beautiful smile shows the world that you possess self-confidence. 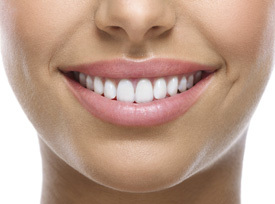 On the other hand, stained or discoloured teeth can make you feel self-conscious. Thanks to teeth whitening services at Smile Creation, you can trade tarnished teeth for a terrific smile! With our whitening options, you can smile brilliantly for an upcoming event, job interview or just treat yourself! Teeth whitening is one of the easiest ways to improve your appearance so you can make a great first impression. The number one requested cosmetic procedure — teeth whitening with Zoom — is available at our clinic. This type of whitening is preferable to drugstore whitening products, which may not allow you to achieve optimal results. These options also take longer and can result in tooth irritation or sensitivity. With Zoom in-chair whitening, you can achieve a stunning, megawatt smile in a single visit. Before the whitening process begins, we will conceal your gums and lips, leaving only your teeth uncovered. Your dentist then will apply the Zoom whitening gel, which contains hydrogen peroxide, to remove long-standing stains. A LED light is also used to speed up the whitening process. You can relax throughout the procedure by listening to music or watching television. Please allow about an hour for prep time followed by 45 minutes for the Zoom procedure. A significant benefit of the in-chair option is your results can last for years if you take care of your teeth by brushing and flossing daily and coming in for checkups twice a year. You don’t have to settle for tarnished teeth. Contact Smile Creation today to book an appointment. We’ll help you achieve a brilliant, photo-ready smile!